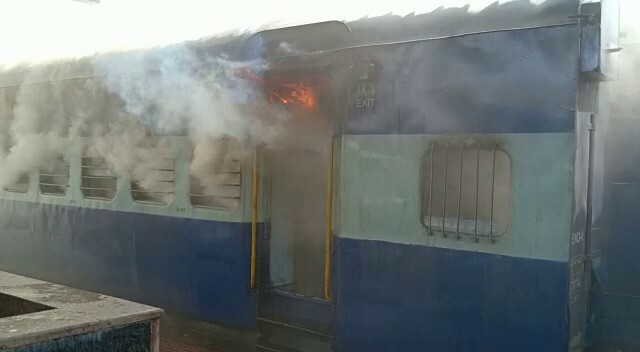 Puri: A day after at least three compartments of Puri-Hatia Tapaswini Express were gutted in a devastating fire, Puri Railway Protection Force (RPF) sleuths today detained two persons in connection with the incident. The duo was being interrogated now. The fire occurred when the empty train was standing at the Puri railway station on Friday. But there was no casualty. The cause of the fire is yet to be ascertained. The fire was first reported from coach S-4 and spread to coach S-5. It then spread to coaches S-2 and S-3 and partially affected them. The flames totally gutted the S-4 compartment of the train which was standing at platform four of the station before its departure in the evening.